In the Welding I program, students are introduced to the welding field through hands on experiences. Training begins with Shielded Metal Arc Welding (SMAW) using E6010, E6011, and E6013 electrodes. 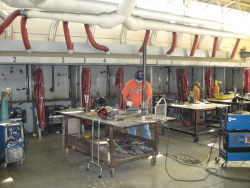 Oxy-fuel welding, cutting and brazing are also part of this program, as are weld joint identification, blueprint reading, sketching, and metal identification.